My best friend Sally and I could ride our ponies for hours through the English countryside where I grew up. On the way back home, all of us – humans and horse – tired from our outing, would mosey our way along the grass verge, feet out of the stirrups, dangling our boots through the cow-parsley, while the ponies took the odd snack-on-the-go. Anybody who remembers the song will know it doesn’t say much for our taste at the time, but it was 1967 and we were 12-years-old, and we were collectively in love with the Tremeloes, who, as it turned out were going to be a one-hit wonder, with not even, as I found out many years later, their own song. What I remember thinking in those far-off days, and it’s a thought that has stayed with me all my life, is that there are two kinds of silence – an outside silence, which in a sense does not really exist, and an inner one, which arrives on a rare occasion – well, rare to me at least – unbidden, as a sudden sense of quiet inner peace. I grew up in the country, and I now live in the country, and I still horse-ride – these days through the green macadamia-covered hills of northern New South Wales. Until recently when we sadly lost my daughter’s Shetland pony, Sally-the-Boy to a brain tumour, I would take my daughter for a trail ride on him, and I would walk beside her. Whenever we did our lane outing, she liked to close her eyes, so, as she said, she could hear the ‘quiet’ sounds. And the quiet sounds were the sounds her pony’s hooves make clip-clopping steadily along, the sound of the breeze, the carolling of the magpies and the far-off hum of the motorway. If you want to further the argument that silence in a sense is a concept, and not something that really exists – think of the phrase, ‘Silence please’, and where it is used. Take a school classroom for instance, at the beginning of an exam and the room falls quiet as students begin the unenviable task of working through an exam paper – is it silent in there? Of course not. There are a million little noises: the scraping of shoes on the floor, the occasional cough, the sound of a chair being adjusted, paper being turned – there is almost, in fact, a ‘noise’ of concentration. And yet, conversely despite this outside noise that makes the notion of silence not – in any world I know at least – a reality, there is that time when you are in the exam, when your inner world is in silence. Then, if you are lucky and you have studied your subject, a kind of meditative trance falls on you where you become unaware of anything around you, blocking out everything other than that which you are doing. When we were children we used to play many games in the fields and the woods around my home. One of them, a perennial favourite, involved an attempt to be silent. One of us would hide our eyes into a tree, while another would pretend to be a Red Indian – as we still called native American Indians then – and would creep silently up behind to scare the person hiding their eyes. Sometimes if one of us was feeling cruel, we would all run off and leave the innocent waiting to be startled alone at the tree, and as I know, that produced its own torturous silence – the silence of no response. 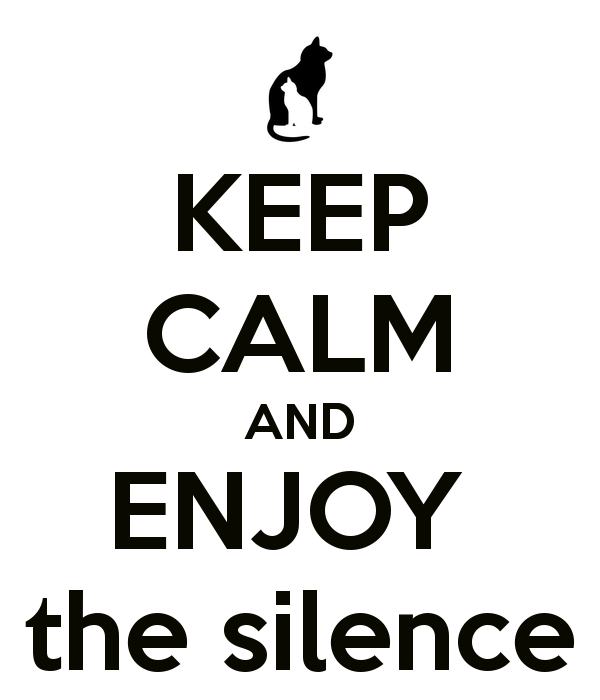 For a large part of the past 35 years I have been a journalist working in busy newspaper and magazine offices, and in those offices the ability to call on inner silence becomes absolutely vital. They’re noisy places, newspaper offices. Not quite as noisy as they were pre-computers, but noisy enough. A large open plan-office with telephones ringing and people talking, meeting, arguing, creating is not necessarily the kind of place that you would think would be conducive to writing, but write you must – and so you do – learning to block out every sound, so that you can meet your deadline. Much, dear reader, as I am doing now. In a relatively quiet, relatively small space in my house, with white desks and two windows overlooking the paddocks below, I am typing an essay on silence. Outside I can hear the sound of the neighbour on his ride-on mower, every now and then my son’s mobile phone pings. I can hear the magpies, crows, rosellas, butcher birds, minah birds and doves that are just part of the noise landscape. One of the dogs is drinking water, each lap magnified by my attempt to hear silence. If I pause for a moment, I can absorb these sounds deep inside, and by absorbing them they become part of the silent interior, the place from which I am attempting to write. William Penn once wrote: “True silence is the rest of the mind; it is to the spirit what sleep is to the body, nourishment and refreshment.” For me that rings true, because the curious thing about turning into the inner world is how energising it is. Sometimes, although not often enough, I manage to get up in the very early hours of the morning to meditate. Even then, deep in the country at four in the morning, the world is not silent. The creaks and groans of an old house keep me company; the cat appears at my side and grooms herself, if there is rain every tiny drop is magnified by the absence of day noise, and the silence of the night reveals itself as anything but, as I try to empty my mind and find that still place within. If nature is so noisy, is it ever silent? 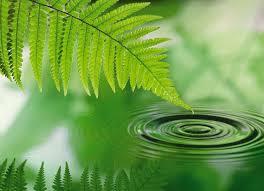 “See how nature – trees, flowers, grass – grow in silence,” said Mother Teresa. “See the stars, the moon and the sun how they move in silence….we need silence to be able to touch souls.” I like that idea that the tree whose branch creaks over my roof, is growing in silence, that silence can be something tangible, if not in fact what we assume it to be. I’ve never thought of the sun, stars and moon as silent, but it’s true, at least from a human perspective. I see its trajectory over my house, I don’t hear it and that somehow reinforces the idea of silence being a sensation, having a presence, rather than an absence. I have often wondered if wilderness places are silent – if you climb Mount Everest, for instance, do you sit in silence? In the Antarctic are you surrounded by silence? People tell me this is not so, that even in the quietest places there is noise, even if the noise is the beating of your own heart – even the absence of noise can be noisy. There is a wonderful book by photographer Jeffrey Gusky entitled ‘Silent Places’. This poignant photographic journey through Eastern Europe documents in black and quite the crumbling landscape of the Holocaust. Houses, synagogues, railway lines, a simple corridor, a door, the entry to a Jewish home now used as a public toilet – every image silently tells a screaming story. His work is of outstanding quality, and somehow what he brings to the photographs is even more poignant than those of the time – the absence of people tells us these were their homes, their places of worship, of education and play – and in the case of the railway line to Auschwitz, their journey to death. You feel that if you stare at them long enough you will bring them to life somehow, that the families will return, peeking out of the shadows, bringing light and love and warmth and noise with them, but until then this landscape bears silent witness to the bloody past. 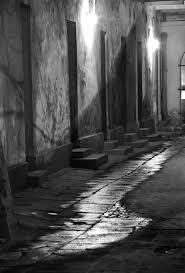 ‘Corridor in Kazimierz’, former Jewish district, Cracow, Polan, Jeffrey Gusky, 1996. Battlefields, memorials, cenotaphs, burial mounds, roman ruins – everywhere where man has once existed but is no longer, it is not the silence, or lack of it, in the direct environment of these places it is the silence of the structures themselves that strikes one as being so overwhelming, hinting at one’s own mortality. I am here, I am noise, I am flesh, I am anything but silent, my blood flows, my heart beats, my stomach growls, my joints creak, my eyes see, my ears hear, tongue tastes, in each movement I make, each kiss or cuddle I give or receive, in each angry word, or happy laugh or bossy command I am an active presence. 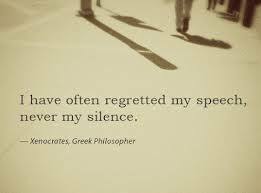 Perhaps it is this more than anything that creates anxiety for a lot of people around the idea of silence. In a world full of iPods, iPads, tablets, phones, facebook and computers, whether we live in the (supposed) peace and quiet of the country, or the white noise of a city, the idea of silence, without or within, can be laden with fear. I can’t hear, does that mean people can’t hear me? Do I, if I am not constantly in contact with humanity, matter? My lack of silence, my constant interaction reassures me – I am here, I do matter, I am in contact. The very fact of modern human’s difficulty with silence means that it is increasingly more important for us to acknowledge it, to hold it within and embrace the silence – to give our soul a chance to speak. Perhaps one of the best-known prose poems in the world is the Desiderata, which far from being written in the 1600s as was commonly thought, was in fact penned by Max Ehrmann in 1927. Ehrmann, a philosopher and writer who wrote six books in ten years and then became a lawyer because he felt he would never write a book that made him enough money to support his family, would be astonished and gratified to know that 84 years later the Desiderata is one of the most widely read poems in the world.